Mike Quinn is no stranger to wilderness adventure. For the last 22 years he has scoured nearly every wilderness basin of Washington State with a singular, determined focus: finding trophy mule deer. And every spring, as early as the melting snows allow, Mike laces up his boots, straps on his 60-lb pack, and begins his quest for these infrequent and elusive high-country bucks. In 2003, Quinn had an epiphany: "I thought that if I set up trail cameras in the areas I scout so heavily, I could effectively monitor favored locations 24-hrs a day — something impossible to do for even the most diehard and time-rich hunters. And if it worked, it might offer a decisive advantage come fall by not wasting time hunting non-productive areas." Seven years later, he still hadn't tested his theory. Early trail cams had too many downfalls — they were large, heavy, ate batteries quickly, and cost an arm and a leg. Then Bushnell introduced a compact, affordable unit, the Trophy Cam. "Trail cams have gotten exponentially better with time," Quinn says. In the spring of 2011, he finally tested his theory. Fifteen thousand images later, his theory has morphed into a law: Trail cams work for wilderness scouting. "I now kick myself in the rear-end for not using these units sooner," he said. "If I had been using these ten years ago, I may have enjoyed greater success on trophy-class animals. More importantly, I would have learned to not waste time hunting basins that did not hold trophy bucks." 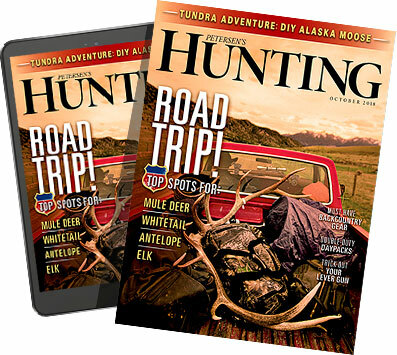 Be sure to check out Mike Quinn's feature article on Western trail cam scouting in the upcoming November issue of Petersen's Hunting.